Looking back over the last little while, I find that my intellectual, emotional and spiritual life has really turned a corner, and I find myself with a mindset that is accelerated beyond what I would have ever expected only a year and a half ago. 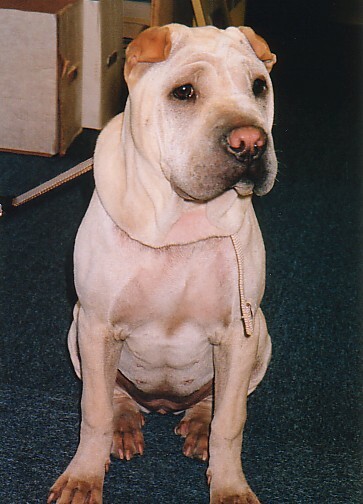 A few months before 2014 began, my wife Maritza and I had just lost our most beloved Niea, a sharpei who was almost twelve years old, and whom we, a childless couple, had always considered to be our daughter. We were both still in a stage of grieving for the life that we could no longer live with Niea visibly by our side. I shared my feelings with several close friends who understood our deep love for our sweet dog-daughter. One friend in particular, Bruce, still dropped by and visited for several hours every Friday, and we would talk about all things metaphysical and paranormal: our Friday happy hour. Bruce is a very aware friend who shares many interests in common with me: extra-terrestrials, past lives, living philosophy, crystals, shamanism, angelic beings and much more along these lines. We had met while I was temporarily hosting a public access show on UFOs and metaphysics called “Cosmic Chronicles,” which was produced by two friends. Immediately after each taping of the live television shows every couple weeks, all the people associated with the show would leave the television studio and gather at a local restaurant affectionately known as the Village Idiot. After striking up a friendship there, Bruce and I would eventually begin to meet at my shop every Friday afternoon for ongoing metaphysical dialogue. For about three hours every week, we share all sorts of news articles, videos, and jabber on about incidents from our lives, our individual dreams and any strange or notable experiences or insights that may have occurred over each past week. 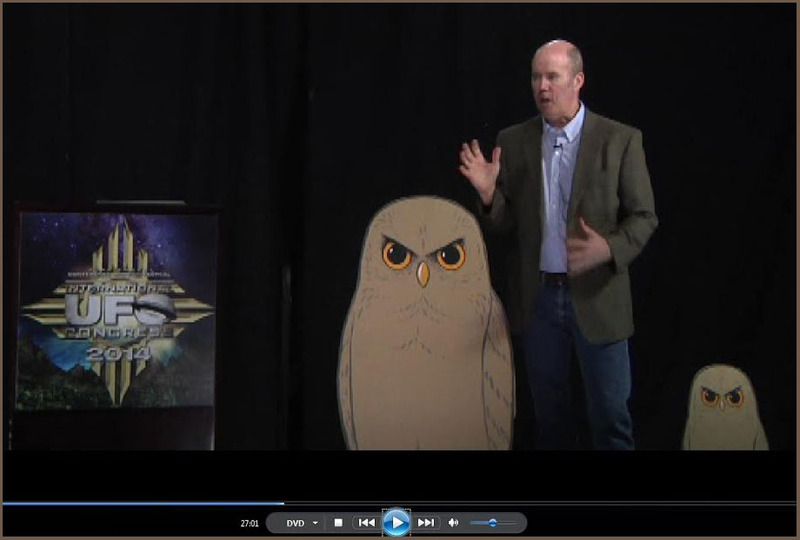 Bruce really encouraged me to attend Clelland’s upcoming owl lecture at the IUFOC event. Even though my finances were in rough shape, I felt the urge to hear this UFO researcher speak, and managed to scrape the money together to attend the mid-February 2014 event for a day and a half with Maritza. As it turned out, my visit to the conference also allowed me to prove to myself that I could be the “new” me– out in the open about my healings– in public around friends, esteemed colleagues and complete strangers. At that point in 2014, Maritza and I had been married for twenty-three years, and all of those years I have avidly been exploring and researching in depth the UFO phenomenon. Maritza tolerated it and indulged me, and while sharing some interest, she does not have the same level of passion for the UFO research that I do. And while Maritza believed me about the events that I claimed that I had with the four-foot white owl, she had no proof or evidence of any kind, and so she simply took my word for it that the encounter had happened, just as I had explained over the years many times to various friends with her by my side. 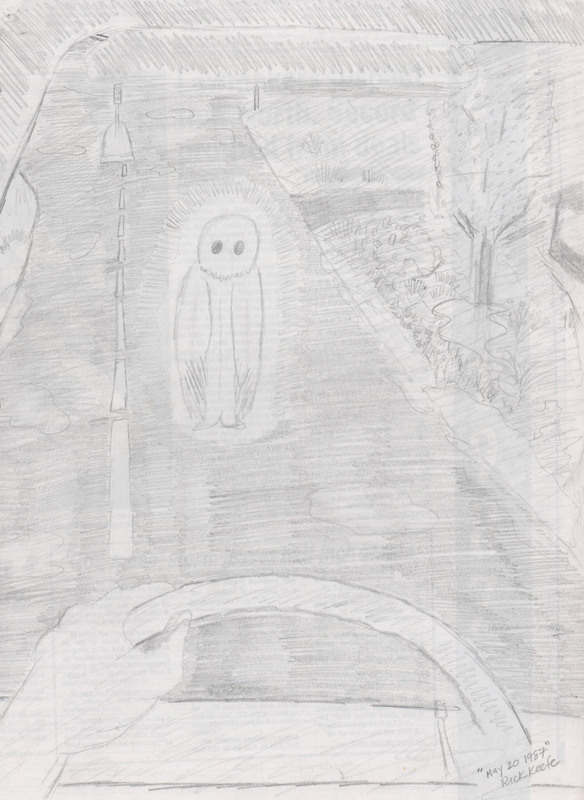 But now, here was a researcher with many similar cases involving UFOS, four-foot-owls and people who experience seeing both. 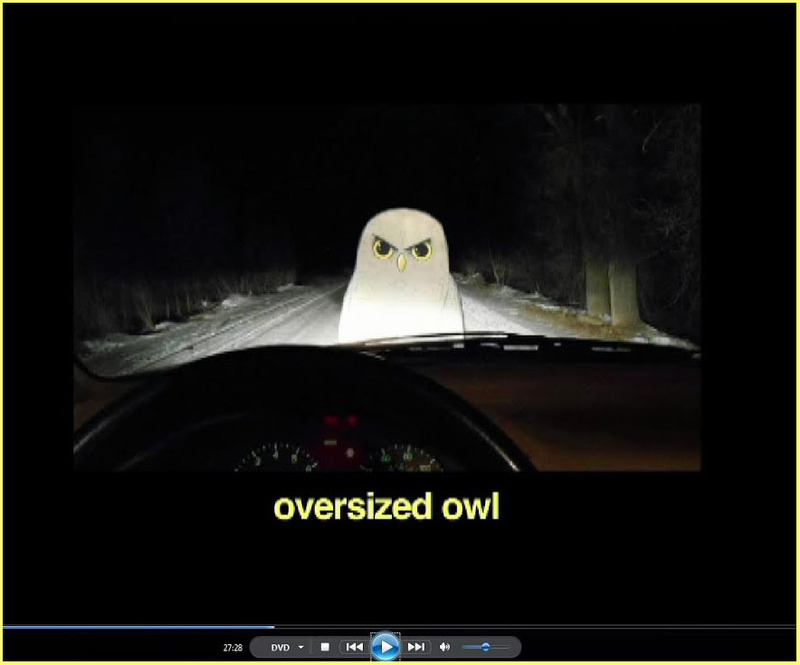 During the lecture, Clelland posted an image made from the perspective behind a steering wheel looking, over the hood of a car, at a large owl standing in the middle of the road, identical in perspective to a drawing that I had sketched shortly after the incident with the owl during the rainstorm in May 1987, a drawing Maritza knew well. We both turned and looked at each other incredulously, with our jaws dropped to the floor. Then, Clelland brought out a standee of a four foot owl, and that did it: Maritza realized that this was a phenomenon not unique to me, her husband, and that changed us both monumentally in terms of us both together accepting the reality of all of this, and the healings and my preoccupation with UFO-related phenomena and metaphysics. Also, I’d like to make it clear that I do not feel that I was ‘abducted’; I feel that I had a ‘contact’ incident, related to medical issues (partially with my sinuses) back in 1987. But then, something far stranger was to occur that afternoon than the mutual epiphanies for Maritza and I. About thirty minutes into Clelland’s lecture, something began to happen that shocked me. Never before had I seen anything like this. Vertically, along Clelland’s right side, stood a carbon copy of Clelland’s shape, but all in a dark green emerald light-body. This green light-body mirrored the movements of Clelland, but out of sync. Clelland, who was at the podium but sometimes moved out from behind it and around it, would move, and then just a split second after, the head, torso and legs of the green light-body would move the same movement, the same direction, and yet other times the green light-body would move first and then Clelland himself would move the same way a split second after. Because this had never happened to me before– seeing someone and one of their mirrored light-bodies–I was a little shocked and awed, and in hushed tones, I told Maritza what I was seeing. Maritza did not want us to attract any attention, and kept hushing me quiet, but I was fit to be tied. I couldn’t believe that I was seeing what I was seeing, and it lasted the next forty five minutes until he finished and left the stage. Afterward, I went up and checked the stage for mirrors, plastic or glass in front of the stage or anything that would fully account for what I saw. There was nothing unusual at all around the very simple stage and camera set. As it turned out, I was fortunate enough to talk with Clelland for a couple hours later after the lecture, and I admired his detailed approach to his subject matter, as well as his keen artistic skill. And as Maritza and I left the convention and lecture hall and walked to the parking lot near the desert’s edge, from just to the north of the Yavapai convention center, an owl began hooting, almost as if the owl was serenading us at sunset as we approached our rental car. How about that for some owl synchronicity!